Here’s a 6-minute video from an inspection I did yesterday that shows me spotting the queen, adding a frame of drawn comb to give the queen more space to lay, and there’s a shot of the bees cleaning up a mouldy frame of pollen taken from one of my dead colonies — and you’ll hear me talking about my plans for inspecting all my hives and how I’m going to manage them. That part sounds boring, but it might give new beekeepers a sense of how to go about inspecting their hives, that is, having a plan and knowing that most plans are a joke. The bees will tell you want they need. 1:46 — The first look at the bees inside the hive, before removing frames. 2:05 — A frame of moldy pollen. 2:18 — A close-up shot of the queen laying an egg. 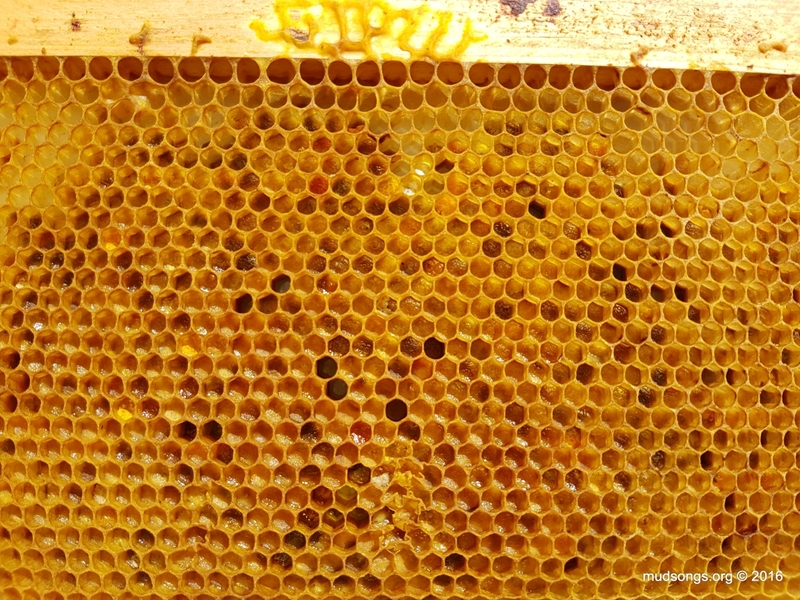 3:53 — Inserting a frame of empty drawn comb to make room for the queen to lay. I mention in the video that I plan to add another deep to the hive, which is what I did, though it’s not in the video. It’s in this 1-minute time-lapse behind-the-scenes video where I explain why the hive has a moisture quilt and a few other things. Part 2 of the hive inspection video: Combs of Pollen and Nectar.